Following the meeting of the European Central Bank kept its monetary policy, the key interest rates have remained at previous levels. At the press conference Mario Draghi said the risks related to growth prospects in the euro area, uncertainty geopolitical factors. The regulator expects to further reduce the level of inflation in the euro zone. In his opinion, it requires significant amounts of stimulus. Details of the new program TLTRO will be announced at the next meeting. At 15:30 Canada will release the price index for new homes in February. US - producer price index for March and be informed about the change of initial applications for unemployment benefits. At 16:30 he will make a speech FOMC member Richard Clarida. At 16:35 to give a speech of FOMC members John Williams. 16:40 In a speech made by members of FOMC, James Bullard. At 21:00 he will make a speech of FOMC members Michelle Bowman. At 23:00 a speech made by members of FOMC Neil Kashkari. Fall and rebound amounted to 45 degrees. Peyrols and press conference Mario Draghi held. According to the results of the EU leaders summit, a new release date was agreed by the United Kingdom from the European Union - on 31 October. Approved the postponement, so traders are now transferred his attention to the profitability of American bonds and negotiations the US and China. After yesterday's intraday spike of 45 degrees should not wait EUR / USD drops to 1.1256. Then we look at the formation of the right side of the stud. 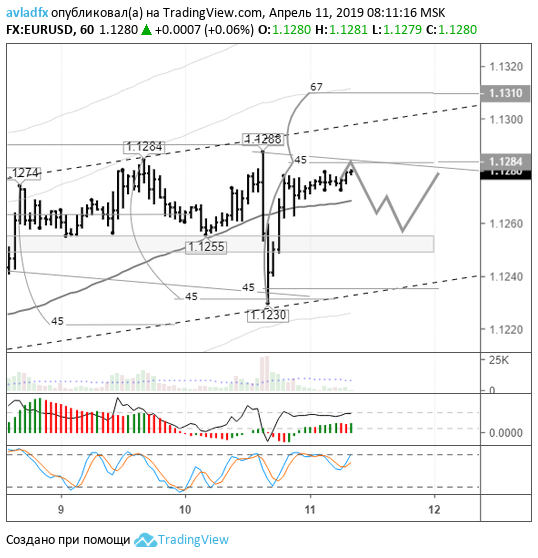 If the EUR / USD rebound from 1.1256 and will return to the level of 1.1280, then possibly raising EUR / USD quotes 1.1310 before. At the level of 1.1268 intermediate support act carrying line lb.